Weston is proud to have Performance Physical Therapy providing sports injury and athletic training services for the 2017-2018 football season. 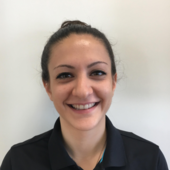 We are pleased to announce Kelsey Cognetta, as the Certified Athletic Trainer, that will be on site to tend to our athletes. Kelsey Cognetta is the athletic trainer covering all games and practices for this season. She has graduated in December of 2016 with a Bachelor's in Athletic Training from Keene State College. Kelsey has attained her National Athletic Trainers’ Association certification in October of 2016 and is a licensed Certified Athletic Trainer in the state of CT. Flexibility can help improve muscle performance and decrease the risk of injury. Low intensity, dynamic movements prior to engaging in a sport can help warm up the body and prepare muscles for higher intensity activities. Use a dynamic warm-up prior to play and static stretches after to increase flexibility when muscles are more elastic. Helmets should be NOCSAE approved. Review the manufacturer's recommendations for proper sizing and fitting. A well-fitting helmet should give uniform, firm pressure around the head, but never cause headaches—and the chin strap should be on and tightened, so there is no slack. Just like the heat, cold weather can present with potential health hazards. Cold weather directly affects the respiratory system, which may make breathing more difficult—especially for athletes with asthma. It also may take longer to warm up the athlete's core temperature and prepare for sports. It is important to stay hydrated and warm up sufficiently. Athletes need to fuel up properly before starting their workout or practice. Carbohydrates are the preferred fuel for exercise. 30 to 60 minutes before exercise eat something that is easily digested and carbohydrate-rich. The recommended amount of carbohydrates per hour for peak performance is 45-60 grams. Between 10-20 grams of protein is needed during workouts also for optimal performance. For exercise that is 90 minutes or longer, a larger amount of food is necessary. Turkey sandwich on whole grain wheat bread with light sandwich spread. Bowl of Multi-grain cereal with low-fat milk. Pretzels or Pita Chips with hummus spread. Just ice it. You can never go wrong with ice, but you CAN go wrong with heat. The purpose of icing an injury is to reduce swelling, pain and limit bruising. This allows the affected area to heal as quickly and efficiently as possible. Using heat for an acute injury can increase inflammation and delay healing. Heat has its place in the recovery process but is usually restricted until 72 hours post-injury or after initial swelling has been reduced. Talk to your Athletic Trainer for best possible uses or ice and heat application. Concussions have become a hot topic in sports medicine, particularly in levels of football from youth up through the NFL. The long-term repercussions of sustaining a concussion are still being studied and new research is becoming available every day. The Center for Disease Control's definition of a concussion is a type of traumatic brain injury—or TBI—caused by a bump, blow, or jolt to the head or by a hit to the body that causes the head and brain to move rapidly back and orth. This sudden movement can cause the brain to bounce around or twist in the skull, stretching and damaging the brain cells and creating chemical changes in the brain. Symptoms to look for after sustaining cranial trauma are blurred vision, memory loss, nausea, overly emotional responses, loss of balance/ coordination, disorientation, sensitivity to noise and light, irritability concentration issues and other abnormal changes. Sustaining a concussion must be diagnosed by a health care provider or physician. Treatment for a concussion consists of total physical and mental rest. The recovery period will vary based on many factors including age, gender, and symptom severity. If you have sustained a blow or force to the head during practice, report immediately to your Athletic Trainer for evaluation and referral as needed. Overtraining, also known as burnout, is becoming a more widespread physical and mental health issue among the youth, high school and collegiate athletic population over the past decade. Athletes have become bigger, faster and stronger at a younger age. With this increase in performance capacity, it is only natural that practice and workouts become longer and more intense than in previous years. The issue arising is that, even with the increased capacity and resistance to fatigue, athletes tend to neglect the most important and key factor to optimal performance—rest. The recovery process from workouts and from extended practice is how athletes increase their performance level. Without adequate rest and recovery, the body will continue to break down and become catabolic. Being in a catabolic state, or continual breakdown of muscle fibers, glycogen stores, and other energy sources, causes a negative impact upon performance thus making workouts and activity suffer. If an athlete continually does not recovery from workouts and does not get proper rest, the body will adapt to performing at subpar levels. This will eventually lead to injury, health issues, and long-term kinesthetic problems. The best way to avoid overtraining is to allow for 24 hours between high-intensity training sessions, and having lower intensity sessions between these higher intensity sessions. Allow one full 24-hour period of rest from activity per week. For more information, consult your Athletic Trainer. Sports participation is one of the best ways to maintain good health and also allows you to be social with friends and others in your community. Athletes should be encouraged to participate in multiple sports and avoid specialization in one sport. This will allow the athlete to avoid overuse injuries and avoid muscle imbalance from over-patterning. Avoiding the occurrence of over-patterning allows the body to recover properly thus causing the athlete to have a better capacity for increased performance. The best way to decrease over-patterning is to have the athlete participate in two or three different sports throughout the year and have one season of the year where the athlete remains active but does not participate in a specific organized sport. As always, an athlete should listen to their body. If there seems to be re-occurring injuries to the same area of the body during sports participation, it may be attributed to over-patterning. The best course of action is proper medical care and rest!